We have a spacious library stocked with encyclopedias and books selected for their informative and educational value catering to all age groups. 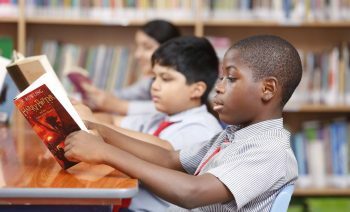 Students are encouraged to form a reading habit and regular book reviews are the norm.Our library has an organized collection of more than 10,000 books, sources of information and other non-book materials such as Audio & Video CD’s, DVD’s, maps, newspapers and magazines, atlas and most recent the E- books with the advent of IT in the school curriculum. The school Library provides information and ideas that are fundamental to functioning successfully in today’s information and knowledge based society. The goal of the Library and Audio- Visual department is to ensure that all members of the school community have equitable access to the variety of resources.The library provides open access to all its students and staff. It serves as a “Learner- Oriented Library”, which supports, extends and individualizes the school’s curriculum. It acts as a center and coordinating agency for all resources used in the teaching learning process. 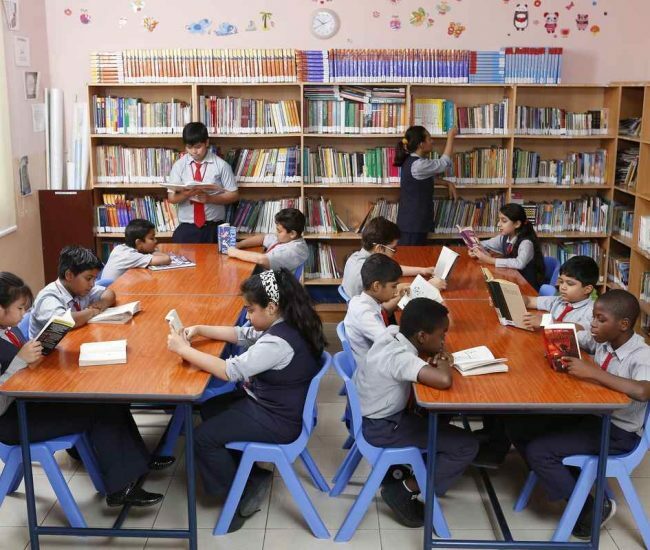 The ambience and the calmness of the library creates a positive impact on the student’s achievements and progress in the school. It equips students with lifelong learning skills and develops imagination enabling them to live as responsible citizens of the world.